Imagine the possibilities... MisoSoupDesign's Ramen Bowl with built-in iPhone dock lets busy people video chat with friends (or play Angry Birds) while slurping their noodles. "Show me embarrasing photos of people who live nearby..." Graph Search (http://www.facebook.com/about/graphsearch) is Facebook’s new search function whose results are the FB pages of members whose profiles match your query. Privacy pundits are sounding the alarm, but Facebook says the new tool will only make it easier to find things that have already been shared with you. Fed up with Facebook? Head on over to the new MySpace, which opened just in time for Justin Timberlake’s return to music. The new Myspace is a music-focused social network, with a simplified design, and a focus on discovering new artists. Kim Dotcom, whose Megaupload cloud storage service was seized last year, is back in business with his new service, Mega. This time, he swears, there’s nothing illegal about it because even he can’t tell what you’re sharing; files are encrypted before they’re uploaded. A free version gives you a generous 50 gigs of cloud storage, or you can pay $10/month for up to 500 gigabytes. Did Google run over a donkey in Botswana? 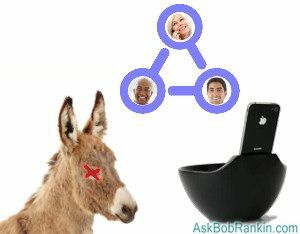 The company denies that its Street View car ran over anything, noting that donkeys often drop to the ground and roll in what’s called a “dust bath.” Besides, there are no tire marks on the donkey. PC sales were down in Q4 2012, by 6.4% versus the previous year, according to IDC Research’s latest figures. Among vendors, Lenovo was up more than 8% while Dell dropped over 20%. HP still leads in sales despite a slight 0.6% decline in sales. "Why yes, that IS a router in my pocket..." The ASUS WL-330NUL USB Pocket Router is a complete 802.11 b/g/n router that looks like a USB thumb drive. Sporting one Ethernet port, the tiny 25 gm device plugs into a computer’s USB 2.0 or 3.0 port. “Infamous Adolf Hitler Quotes” is one of several free Android apps featuring the Nazi leader’s writings available in the Google Play store. Some people have a problem with this apparent violation of the company’s “no hate speech” policy. The Amazon MP3 Store for iPhone and iPod is a Web app for Safari browsers. Since it isn’t downloaded from the Apple App Store, Amazon doesn’t have to pay Apple’s 30% fee for in-app purchases. Pandora’s 2012 statistics are pretty impressive. Up to 55 million users per month listened to 13 billion hours of music across 1 million songs and 100,000 artists. On the down side, the bigger Pandora’s audience the higher the licensing fees it must pay to the recording industry; Pandora’s profit was only $2 million. The retail price of Windows 8 Pro will jump from $40 to $200 on February 1. All Windows 8 products will increase in price after the expiration of introductory offers on January 31st. Most recent comments on "Geekly Update - 23 January 2013"
Who is AdolPH Hitler. The German spelling of Adolf is ADOLF not ADOLPH same for Josef Stalin not Jooseph.